Mallinckrodt Pharmaceuticals has purchased and donated more than 1.5 million drug deactivation pouches across the U.S., through collaboration with policymakers, community organizations, health care professionals, law enforcement personnel, and industry partners. The purpose of the initiative is “to ensure the responsible use of pain medication and to prevent unused medications from ending up in the wrong hands,” Rhonda Sciarra, senior manager of communications at Mallinckrodt, told AT Forum. Pouch distribution started last year in several states and has been managed locally with donation partners in local communities where donations have been announced. This past October Mallinckrodt, based in Staines-upon-Thames, England, with its U.S. headquarters in St. Louis, Missouri, provided more than 60,000 pouches to families in West Virginia. Under this statewide initiative, announced by U.S. Sen. Joe Manchin (D-West Virginia), each of the state’s 55 counties will receive 1,000 pouches for families to use. Free distribution has been coordinated by Sen. Manchin’s office, working with each county sheriff’s office and with local law enforcement, drug prevention coalitions, and senior centers. More than 100,000 drug deactivation pouches have been provided to community organizations in the greater Washington, D.C. area. The pouches will be distributed to families throughout the D.C. area through local community coalitions. All told, when the 1.5 million pouches are completely distributed, more than 50 million unused prescription opioid pills will have been destroyed and prevented from being diverted. 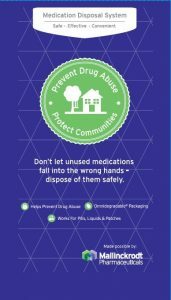 Mallinckrodt also provided 160,000 drug deactivation pouches to families across seven states, the Midwest, and Central Appalachia, through a partnership with 800 Walmart store pharmacy locations. Mallinckrodt announced its comprehensive donation in June 2016, saying it would purchase and donate the Deterra drug deactivation pouches. Prior to June 2016, Mallinckrodt had already made about 500,000 pouches available to providers, patient groups, and other stakeholders through partnerships with organizations such as CADCA, The Jed Foundation (a not-for-profit promoting behavioral health for college students), and ACT Missouri (a not-for-profit drug and alcohol awareness program). The pouch distributions are part of Mallinckrodt’s comprehensive vision to advance patient safety, including investment in the expanded use of opioid abuse-deterrent technology. The company supports developing tamper-resistant/abuse-deterrent technologies, and regulatory standards that stand behind these technologies. The medication deactivation pouches manufactured by Minneapolis-based Verde Technologies deactivate prescription drugs and make their chemical compounds safe for landfills. Chemically neutralizing unused prescription opioids also prevents them from being susceptible to theft, diversion, and misuse. After placing medications in the pouch and adding tap water, the user can seal the pouch and throw it away with household trash. The pouches are completely biodegradable, providing an environmentally responsible way to deactivate and dispose of drugs. “As a company focused on the health and well-being of our patients and communities, Mallinckrodt has long been a strong advocate of addressing the complex issues of opioid misuse and abuse that cause so much harm to families,” said Mark Trudeau, Mallinckrodt President and Chief Executive Officer. “We share the concerns of parents across the nation, and believe that providing patients with a safe, environmentally responsible way to dispose of unused medications is critical in this fight against prescription drug abuse,” added Mr. Trudeau. A national survey of adults who used prescription opioids showed that nearly 6 out of 10 had or expect to have leftover opioids, indicate findings published online June 13, 2016 in JAMA Internal Medicine. As evidence of the escalating opioid misuse problem in the United States, nearly 68% of those who used prescription pain relievers nonmedically in 2012-2013 got them from friends or relatives, according to the 2013 Substance Abuse and Mental Health Services Administration (SAMHSA) National Survey on Drug Use and Health. Preventing opioid misuse and diversion is a national priority that requires the active engagement of all stakeholders. Through its actions, Mallinckrodt is taking positive steps to help prevent drug abuse by making prescription opioids less accessible for nonmedical uses.